An old king in feudal Japan decides to abdicate in favour of his eldest son. His third son tries to warn him that this will cause in-fighting and that his older siblings will betray the king – but he ignores the warning, instead choosing to disown the third son. However, it doesn’t take long for the son’s prophesy to come true, and he endeavours to protect his father whilst bitter war is declared. Ran is incredibly stunning with incredible battle scenes – the colours of the banners and pennants of the armies make for an amazing spectacle of a film. But my favourite bits by far are the utterly hilarious false eyebrows which everyone seemed to wear, except for the poor princess who has no eyebrows at all. 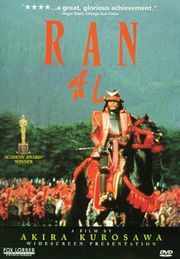 A classic Kurosawa – epic and visually beautiful. This entry was posted in War Films, YearInFilm and tagged 1980s, 7/10, action, arthouse, download, drama, japan. Bookmark the permalink.